Real-time risk management, what is it? Real-time risk management addresses the rapidly changing threat landscape with up to the minute information about threats, vulnerabilities and assets. This mindset shift has been a rising trend since the rise in volume of threats on the internet and the ineffectiveness of compliance audits in protecting them against these threats. 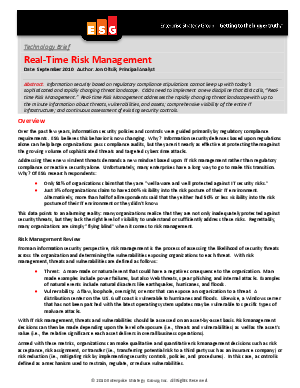 Read this technology brief to further educate yourself on the mechanics of real-time risk management and how this mindset shift in security can enhance your security knowledge as well as automation.